Our friends at RIDES magazine have a detailed look at the Gold 'KING ZL1' Camaro we dubbed (in a republish) the World's Worst Camaro ZL1 in their next issue. It turns out there's more to the story than we ever imagined and they were nice enough to share the information with the fans, haters, and bemused among us. — Ed. 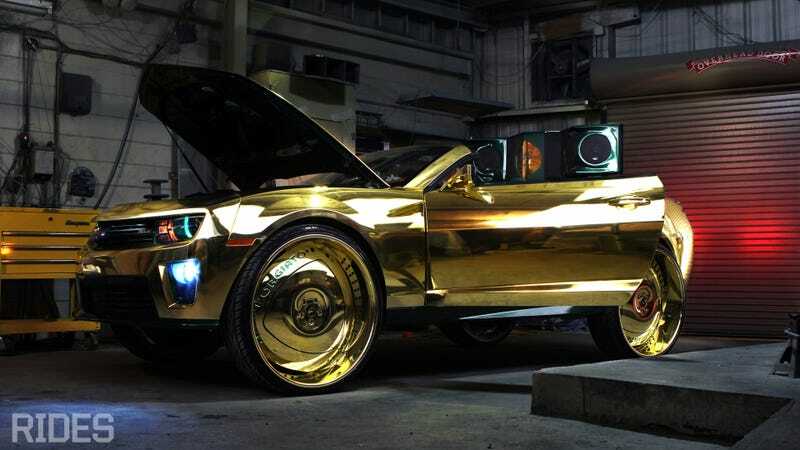 Since the debut of the gold ‘King ZL1‘ Camaro, there's been a relentless onslaught of hate, banter and even racism aimed in the direction of the car, its owner and the shop that created it. And as we concede that a car like this isn't for everyone, we feel it has been taken a bit too seriously. This Camaro was built for one purpose – to stunt – and more specifically to win a car show or two. Does the car serve its purpose? Yes. And for those of you spewing erroneous comments on the webz, we'd like to clear the air. #1 – The car is PAINTED, not vinyl-wrapped and this has been officially confirmed by RIDES. Don't believe us? Look back at Linny J's video we posted again and notice the gold in the engine bay and trunk. Any vinyl wrap professional will tell you that's virtually impossible to achieve with vinyl. 813 Customs used the Cosmichrome paint and then candied over it to create the shiny gold effect, and you don't even want to know how much a paint job like that costs. #2 - It's not a ZL1, it's an SS cloned to resemble a ZL1. That being said, we can go ahead and cancel out 50 percent of the genius posts on sites like Jalopnik and Camaro5 where the prolific bloggers so eloquently describe how a limited production future collector car has been desecrated. It's a new school Chevy with cheap plastic and a nice motor, not a classic First Gen with a numbers-matching drive train. #3 – We're featuring the car in the next issue of RIDES. The owner of 813 Customs and good friend to RIDES, Joe Barravecchio, called the night of the car's completion and we promptly dispatched our photographer, Ravi Angard, to shoot it. Why are we featuring it? We love custom cars and anyone who claims they're into them understands that they come in all forms. And if you're truly apart of this culture, regardless if you have a lifted truck or a stanced tuner, there are elements featured on the ‘King ZL1′ that you can appreciate. That behind said, enjoy this exclusive photo of the gold ‘King ZL1′ Camaro as we leave you with our favorite comment from the Jalopnik thread by poster Eggwich McSpencer, "Whoever built this is very skilled, and is a car guy. Whoever ordered this, loves cars, maybe not in the same way as you or me, but still, they love cars, and they are a car guy. You are not better than them, you are just different. Rock on, Gold Camaro Weirdo Guy." This story originally appeared on RIDES-mag.com on November 20, 2012, and was republished with permission. Look for the car in their next issue.